Maurice McCabe arrives at the Disclosures Tribunal. 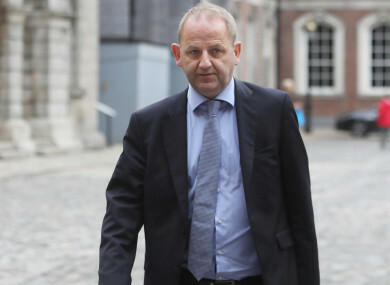 MAURICE MCCABE has said that he is “very happy” with the report of the Disclosures Tribunal but that knowing there was a campaign to slander him is “hard to take”. McCabe was speaking to RTÉ’s Prime Time programme following the publication of the report today. In his report, Mr Justice Peter Charleton described McCabe as “a good citizen and a good police officer”, finding that there had been a “campaign of calumny” against him by former Garda Commissioner Martin Callinan. This campaign was found to be “actively aided” by his press officer Superintendent David Taylor. The Disclosures Tribunal, headed by Charleton, had been tasked with looking into allegations that there had been a smear campaign against McCabe, orchestrated by senior gardaí. Charleton found that Callinan told Fianna Fáil TD John McGuinness that McCabe had sexually abused members of his own family. He also found that Callinan told journalist Philip Boucher Hayes that McCabe had “psychological” and “psychiatric” issues and had done terrible things. Asked about the campaign against him by the two men, McCabe said it was “astonishing” but that he had know it was the case for some time. I see that finding and it’s an astonishing finding but I suppose from the very start of the inquiry I knew they were involved in it, so it didn’t come as a major surprise to me. But, hard to take. The garda whistleblower said that he accepted the full findings of the report and that he is “very happy”. “I am very happy for me, and Lorraine and for the kids and my extended family,” McCabe said. Charleton also found that there was no “credible evidence” that former garda commissioner Nóirín O’Sullivan “played any hand act or part” in any campaign against him. McCabe said that he also accepts this finding but that he believes he could have been treated better by O’Sullivan. “I saw that finding and I accept that finding but it’s a pity she didn’t say this to me back at the O’Higgins Commission, or meet with me then when this all arose. But I accept the finding,” McCabe stated. Reacting to the report, current Garda Commissioner Drew Harris said that McCabe would be supported by the force. “I acknowledge the difficult time he and his family have endured and I hope this chapter is drawing to a close,” said Harris. McCabe also told Prime Time that he wished the publication of the report would allow him to move forward. “We haven’t read it all yet, but we’re so thrilled. Because it means it’s finished for us now, all is over. I can get back to my normal job hopefully,” he said. Email “Maurice McCabe: 'It’s finished for us now, all is over. I can get back to my normal job hopefully' ”. Feedback on “Maurice McCabe: 'It’s finished for us now, all is over. I can get back to my normal job hopefully' ”.